In fact, the Cape Bathurst polynya is a critical place for ringed seals and bearded seals to congregate in spring. Therefore, this is where many Southern Beaufort polar bears go to hunt. The presence of the polynya is especially crucial in years like this one, when very thick sea ice covers most of the Beaufort Sea. A little-known edited volume published by the Canadian Wildlife Service almost 35 years ago (Stirling and Cleator 1981) outlined the state of Canada’s Arctic polynyas between 1975 and 1979, provided an overview of why these open water features are so important to the ecology of the Arctic. It provides some much-needed historical perspective on the area of open water that appeared this year in late April in the eastern Beaufort. 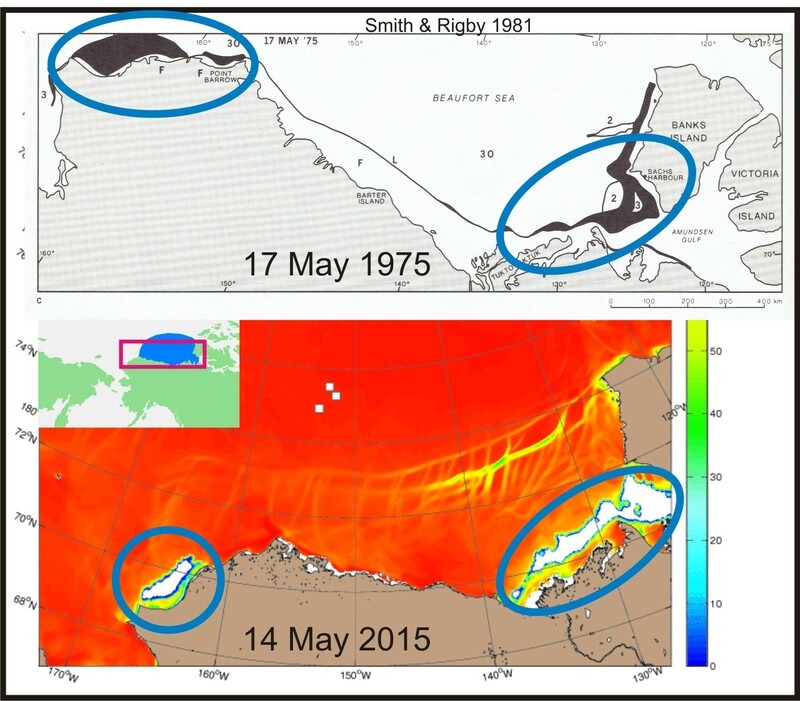 A paper by Smith and Rigby contains maps that show conditions as they developed in May 1975 (Fig. 1 above and Fig. 2 below). The ice data they had to work with at the time appear to have underestimated the extent of open water, as I discuss below, but the location and timing compare well with this year’s polynya. “Some open water can be found in virtually all months somewhere in western Amundsen Gulf in the area of Cape Bathurst, Cape Parry, and Cape Kellet (Banks Island). Open water can appear as early as sometime in December, although it is not until April that a characteristic form to the polynya appears. It may surprise you to learn that there is also a patch of open water off the western end of the Alaska coast near Barrow, which shows up in the Beaufort Sea ice concentration map below (Fig. 2). That polynya is not unusual either. Figure 2. West Barrow polynya at 17 May 1975 (Smith and Rigby 1981:Fig. 15c) and the polynya this year at 14 May (Naval Research Laboratory). Click to enlarge. “In contrast to the region discussed above, sizeable areas of open water rarely occur between Mackenzie Bay [mouth of the Mackenzie River] and Point Barrow for any length of lime during the winter. The lead along this part of the coast tends to remain closed. In the area west of Point Barrow, however, open water and new ice is evident in most months, but again, it does not become continuous and extensive until about mid May. In other words, Stirling and colleagues suggested in 1981 that the marked declines in ringed seal, bearded seal and polar bear numbers in the mid-1970s (discussed many times on this blog) was due primarily to the fact that the Cape Bathurst polynya did not develop as usual because thick ice conditions prevented it. All in all, considering how much thick, multiyear ice there has been in the Southern Beaufort this year since early April (Figs. 3 and 4 below), it seems to me that polar bears are very lucky that the Cape Bathurst polynya developed a bit earlier than usual this year. Figure 3. 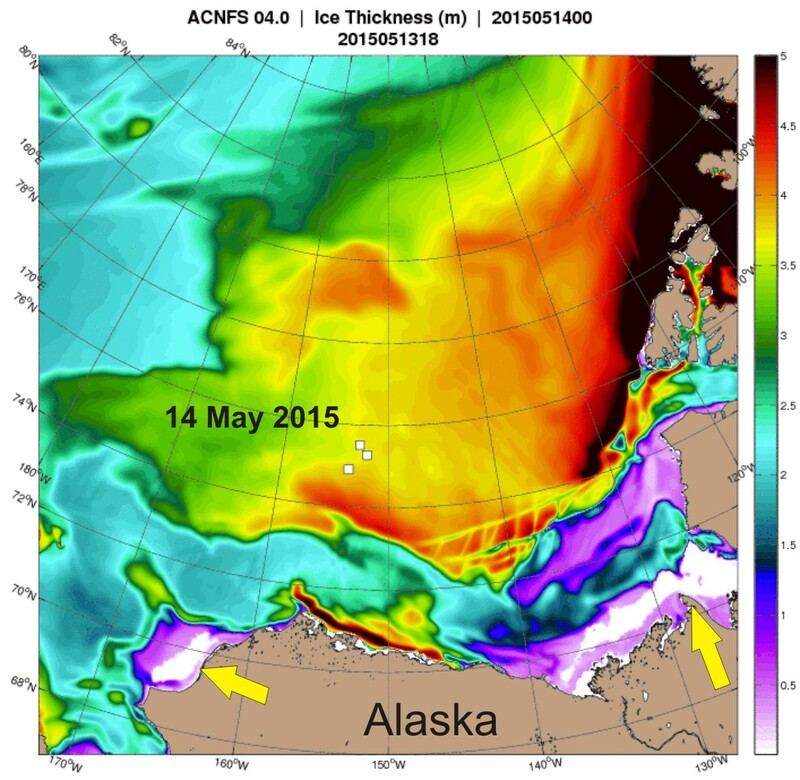 Ice thickness map from the Naval Research Laboratory for 14 May 2015. Figure 4. Ice thickness map from the Naval Research Laboratory for 8 April 2015. 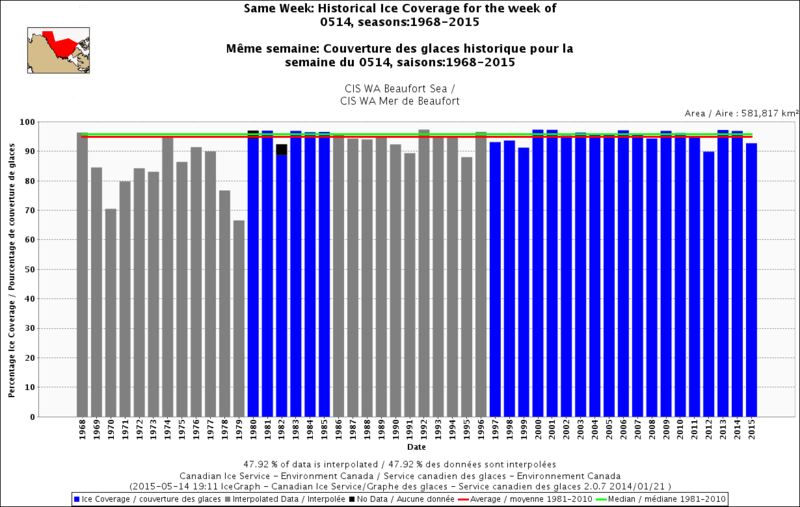 The Canadian Ice Service (CIS) weekly graphs for historical ice coverage in the Beaufort Sea (Fig. 5, below) show that sea ice this year is slightly below average for this date (14 May) but not as low as virtually every year from 1968 to 1979 (only 1968 and 1974 had average ice levels). Without polynyas and extensive shoreleads, the Beaufort Sea is nearly 100% ice covered in late winter and spring. When ice coverage is not close to 100% at this time of year, it indicates not only the presence of polynyas, but their relative size. Take a look at the value for 1975 in Fig 5 (below), the year the Smith and Rigby maps featured in Figs. 1 and 2 were constructed (using different sea ice data). CIS attributes 1975 with an ice coverage of about 86-87%, well below the level seen this year, which has about 93% ice coverage. That suggests to me that the 1975 polynya may have been as large as this year’s, or even larger. Figure 5. Ice cover in the Beaufort Sea for the week of 14 May, 1968-2015, using Canadian Ice Service data. Click to enlarge. The areas of open water in the eastern Beaufort and west of Point Barrow that are obvious in Beaufort Sea ice maps for early to mid-May are not unusual, not as large as they have been in the past, and are beneficial to polar bears and their prey. Given the amount of thick, multiyear ice present along the north slope of Alaska and in the offshore region, polar bears are very lucky that these polynyas developed when they did. Dunbar, M.J. 1981. Physical causes and biological significance of polynyas and other open water in sea ice. In: Polynyas in the Canadian Arctic, Stirling, I. and Cleator, H. (eds), pg. 29-43. Canadian Wildlife Service, Occasional Paper No. 45. Ottawa. Stirling, I. and Cleator, H. (eds). 1981. Polynyas in the Canadian Arctic. Canadian Wildlife Service, Occasional Paper No. 45. Ottawa. Smith, M. and Rigby, B. 1981. Distribution of polynyas in the Canadian Arctic. In: Polynyas in the Canadian Arctic, Stirling, I. and Cleator, H. (eds), pg. 7-28. Canadian Wildlife Service, Occasional Paper No. 45. Ottawa. Stirling, I, Cleator, H. and Smith, T.G. 1981. Marine mammals. In: Polynyas in the Canadian Arctic, Stirling, I. and Cleator, H. (eds), pg. 45-58. Canadian Wildlife Service, Occasional Paper No. 45. Ottawa. Pdf of pertinent excerpts of above papers here. This entry was posted in Life History, Sea ice habitat and tagged Alaska, Arctic, bearded seal, Beaufort Sea, Cape Bathurst, Cleator, ice thickness, open water, Point Barrow, polynya, ringed seal, sea ice, spring, Stirling. Bookmark the permalink.